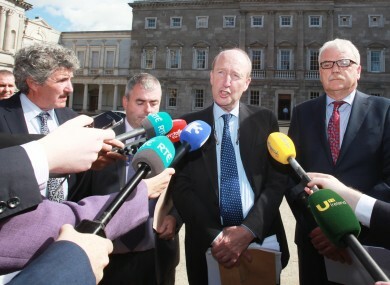 Members of the Independent Alliance said it would back the appeal in order to keep the government in power. IT WAS “CRUEL” of Europe’s competition commissioner Margrethe Vestager to say that Ireland could spend the €13 billion Apple tax rebate in whatever way it sees fit. Following today’s Cabinet meeting, in which government ministers decided to appeal the Apple tax ruling, Independent Alliance TD Kevin Boxer Moran said it was wrong to make such statements in public. Boxer Moran said “false hope” was given to the Irish people that the money could be spent on hospitals and schools. It is cruel to send out that message to the people of Ireland. This money cannot be spent and even if a time where it does come, we might not receive a penny of it. The decision by all Cabinet members to back an appeal today puts an end to any speculation the government would topple over the Apple tax issue. Despite reports there were rifts between Independent Alliance and Fine Gael members, unity was displayed in front of the cameras today. Minister of State for Training, Skills and Innovation, John Halligan, who was at the centre of dissent in the talks this week, quashed any such sentiments. Halligan said he has committed to supporting the government motion in the Dáil next week if it means the government gets to stay in power. He also said that promised improvements to Waterford Regional Hospital were not used as a pawn during discussions on the appeal. Defending his decision to support the appeal, he said there is no certainty that Ireland would get the €13 billion from Apple. I have made my position quite clear. I believe Apple should pay the money. I have also made it quite clear that I don’t think the government should be destabilised or brought down on this issue. There are far more important issues – the Budget, Brexit – that are coming down the line. I think the Independent Alliance have got a good deal. For the first time ever in the history of the State there will be an independent review as to what tax is being paid by the multinationals and if they are paying fair tax. Today, the Independent Alliance said it got what it wanted from the deal – with some compromises – and Minister of State for Disability Finian McGrath said sections two, three and four of the motion “have the prints of the Independent Alliance all over it”. The aspects which commit to the highest international standards of transparency, no preferential tax treatment for companies, and the review of Ireland’s corporation tax policy, “are our blueprints”, claimed McGrath. “When you are in power, in Cabinet, you have to compromise, but the bottom line is we got enough in this package to get our policies over the line and I am very proud of that,” he said. We strongly support the whole principle and economic strategy of having foreign investment in this country, but yes, everybody has to pay their fair share of tax and we managed to get that into the agreement. Boxer Moran said today’s agreement was an example of a new way of politics, that everyone in government and the media would have to get used to. Minister Ross said it is a “core value” of the Independent Alliance that issues such as this are debated and supported by the entire Dáil. Email “'Cruel promises made to the Irish people that Apple's billions would go to hospitals'”. Feedback on “'Cruel promises made to the Irish people that Apple's billions would go to hospitals'”.